Q1. What is EZY Basecoat ? Basecoat is the middle layer of automotive paint structure which is the color layer. 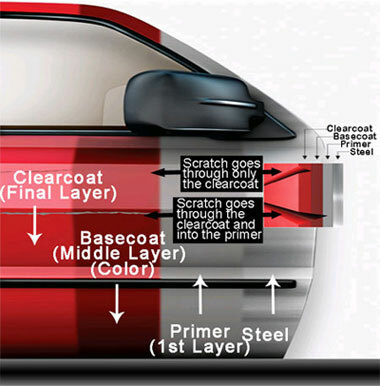 Basically there are 3 layers in car paint structure, 1st layer is Primer which is directly contact to bare metal, 2nd layer is Basecoat which is provide color appearance, lastly finished by Clearcoat which is a layer of transparent coat that to protect the Basecoat from UV, weather, and provide glossy finishing. Q2. What is EZY Wax & Grease Removal? EZY Wax & Grease Removal is a special solvent that can thoroughly remove all kind of wax, oil, grease, silicon, micro dirt and tar. It is important to thoroughly clean the surface as fail to do so may cause the new paint lift up. It also help to provide the maximum adhesion for Basecoat to stick on repairing surface. So it is very important to clean the repairing surface before apply Basecoat. This special solvent will not affect the existing original paint. Q3. Can I buy EZY Basecoat only to touch-up my car? To complete a full repairing process and achieve the original condition, you need to use EZY Wax & Grease Removal for repairing surface preparation which is chemically cleaning process, and followed by EZY Basecoat application, lastly you need to apply the EZY Clearcoat as final protection finishing and color tone accuracy. Q4. What is EZY Rubbing Compound ? Q5. Where do your paints comes from? We use the material from original OEM automotive paint manufacturer such as Kansai (Alesco), Du Pont, PPG, ICI and Nippon to produce the EZY Basecoat, other products are manufactured on our own by accordings to OEM standard requirement. All our products have go through few series of original paint performance testing. Q6. Why should I use Ezy Clearcoat? The function of EZY Clearcoat is just like human skin. It seal the Basecoat and provide ultimate protection from UV, weather, prevend color from fading and peel off. Provide accuracy on color matching to existing paint. It also makes the painted surface glossy, shine and durable. Q7. How long will EZY Touch Up Paints can stored ? For new unopen bottles, the EZY Touch Up Paints can stored for about 3 years in room temperature. .
For balance of paints after bottle opened and closed properly, usually can store for about 1 year in room temperature. Q8. How long will EZY Touch Up Paints last on my vehicle? Since EZY Touch Up Paint is original automotive refinish system. It has been tested and formulated to last if you really take good care of it and follow the application instruction given.The durability should same as original factory paint. Q9. Why some EZY Basecoat come with Part A & Part B? These are special effect colors called Tri-Coat that require an addition step to apply. Usually for Pearl White Color. There will be 2 bottles of Basecoat for Tri-Coat You should apply the Basecoat Part A first, after all layers of Part A completed, then finished by a very thin layer of Part B and finally Clearcoat. Make sure the coat is dry before applying new coat. Part B must always on top of Part A, Part A CANNOT applied on top of Part B. Please refer the "Direction Of Use" in our website for more details. Q10. Can EZY Touch Up Paints apply on any surface? EZY Touch Up Paints can be applied and perform very well on exterior car body surfaces such as metal, plastic, rubber, fiberglass, PU, PP, ABS and wood. Q11. Can I mix one of your products with other brands products? We are not recommend other company's products as we only test with our own products. Q12. Is your paint match exactly same as my car's original paint? The products of EZY Touch Up is produced base on the OEM formulations provided by the original paint manufacturers and mixed by computer by according to your car"s Factory Color Code. The color may look slightly different from your car's color due to aging, and the condition of surrounding during application . But the deviation is minor. Q13. What Is Factory Color Code and where can I find it? Factory Color Code is an unique code that shows your car's original color. Every vehicle has a factory color code, but it is located in different places, depending on the manufacturer, year, assembly plant and model. It is important to get the right Color Code for your car. Normally you can find the Color Code by refer to your Owner's Manual Book, Service Maintenance Booklet or using our Color Code Location Guide to locate your vehicle's Color Code. Q14. Why I cant find my car's color code from your color code list? 1st - your car's model is brand new and our technician not yet uploading to website, but for sure we have most the color code in our database, for fastest your order process ,you can Contact Us by providing the needed details, we will update our color code list immediately and inform you by mail when done. 2nd - sometimes the color code that you found in your car's color code tag may in Short form, however all the color code in our list is OEM standard color code ,for example Proton Saga BLM Solid White II ,the standard color code is A0157, but the color code in your car's color code tag shown 157 only, in this case, please choose A0157 from our list or if you still confuse, please contact us, we will show you the right code. 3rd - All our color code listed on website is based on most of the cars used in Asia market, some imported car's color code may not completely listed on website, if you want to order the color which is not in our list, please contact us, we will work out for you. Q15. Why I still cannot find the color code tag from my car even refer to your Color Code Location Guide? The Color Code label for some car manufacturer may 'hide' in difficult reach places, and need to remove the insulation panel or carpet. For more easier, you can Contact Us and provide us the details of your car, we will reply to you as soon once we have the relevent infomation. Q16. Why some different color code having the same color name in your list? which should I refer ? Sometimes you may confuse whether base on Color Code or Color Name when choosing your car's color from our list. Please always remember that only choose your vehicle's color from our list by according to the COLOR CODE, not the Color Name, as sometimes 2 different Color Code with different color appearance using the Same Color name, or another situation is some Color Code got few different Color Name. Example 1: Toyota Camry 2002 ,color code for 3N4 and 3N6 sharing the same color name ,both also call Dark Red. In fact, the color appearance for 3N4 and 3N6 are totally different. Example 2: Toyota Camry 2002 ,color code for 202 got few color name, such as Mica Black, Black, and Black Mica. Therefore, in this situation, always choose your color by according to the COLOR CODE, not the Color Name. Q17. Why I cant find my car's model in your list? Most of the global car manufacturer producing numbers of different models from time to time, we are unable to list out all the models that the car manufacturer had produced, we had try our best to list all the most popular models for each manufacturer . However it is very common that most of the car manufacturer will share the same color code between their different models (even different manufacturing plant at different country), since Color Code is unique, and 1 Color Code only use 1 mixing formula and represent only 1 type of color appearance. So even you cant find your car's model from our list, you still can order the EZY Touch Up Paint by select the name of your car's manufacturer and choose your car's Color Code (that you found on your car) then for Model catagory, select "All Models" . You should get the color you want, as long as the Color Code are same. ii. Apply Basecoat as wet as possible. Let the paint dry for 30 days.Then polish the paint to get smooth & glossy surface. 2. Why the color looks dark? Mine is metallic color. The small metallic flakes do not lay evenly. Basecoat should applied in even, light coat in 1 direction only. As wet as possible. Do not rub & only dab on. Remove the new fresh paint (within 30 days after application) by according to the guideline below , and do over again. Basecoat should apply as wet as possible. 3. Why my paint work looks like an orange skin? The paint dry out before they can flow out & level smoothly do not apply at a strong wind area. Remove the new fresh paint (within 30 days) by according to the guideline below , and do over again. ii. Do not apply thick coat Let the paint dry itself for longer time. Do not penetrate the paint with fingernail. ii. Use full set of EZY products. iii. must clean the surface with EZY Wax & Grease Removal for optimum adhesion. Remove the new fresh paint (within 30 days) by according to the guideline below , and do over again. 6. Why the new paint sag or sink after completely dry ? i. Scratches too deep. i. Apply more layer light coat in 1 direction only. ii. Do not rub & only dab on. Remove the new fresh paint (within 30 days) by according to the guideline below , and do over again. If you want to remove the new paint and redo, you can use the light thinner (normally can get from hardware shop for few ringgit a bottle) to remove it. Use a clean cloth ,wrap your finger with the clean cloth, mist little amount of light thinner on the top fingertip and gently wipe the new paint out. (any thinner spill over to surrounding have to clean up immediately). The new paint will stick on the cloth which misted with thinner, so becareful not to contact to the existing paint surface to avoid the removed paint stick on existing paint surface again. Keep on repeat and rotate with clean cloth surface until the new paint totally removed. After that, you can redo the touchup work. ** don't put the cloth which is misted with thinner on car body. Q18. How do I place an order? Find your car’s color code by refer to owner manual book, or use our Color Code Location Guide to locate the Color Code. After got your car’s Color Code, choose the color code from our color list either with the “Search” features or direct go to product page click on Ezy Combo Set, choose the wanted color code, and put in to cart. For first time user, it is recommended to buy the Combo Set which is more cheaper than purchase separately in single bottle. Click 'continue' to continue with shopping. Or else, click 'check out' to proceed. Confirm your item selected correct and click " Proceed To Checkout "
Key in your billing and shipping particulars and click " Save & Continue Checkout "
Select your payment method and click " Place Order "
You will be transferred to an online payment page to make payment. Your order will be proceed after payment successuful received. Click on the button " PAYMENT NOTIFICATION FORM" to submit the bank in slip / screenshot or others payment proof to us for further proceed. (if you can't upload with mobile version website, please switch to desktop version or use desktop computer). Q19. How do I know my order status? Kindly login www.ezytouchup.com and click on the "Order Status" on top of the page and login. The needed info of "Internet Reference" and "Order Number ID" can be found in the order confirmation email send to you. Q20. In what currency I will pay? All transactions will be in MYR (Malaysian Ringgit) or you can change to USD. Q21. When will I receive my item? We will send out your item within 2 working days after the status of order in "confirm". Delivery usually take 2 – 4 working days for location within Malaysia nationwide and 10 to 25 working days for international (out of Malaysia). If you did not receive your purchased item within the above period, kindly contact us for clarification. Further shipping details please check the SHIPPING POLICY. Q22. Is my personal details safe with you? Q23. Is order online payment secured? Our Online payment system is powered by MOLPay and Netbuilder (M) Sdn Bhd. (NBePay). Your online payment receiver details will appear as MOLPay-EZY Auto or Netbuilder (M) Sdn Bhd.